Finely chop the onion, garlic, ginger and capsicum and brown gently in a little olive oil in a medium saucepan. Dice the potato and steak into 0.75 cm cubes and add to the saucepan. Cover and cook for 10 mins on low heat. Add the remaining ingredients and stir well, crushing the tomatoes with a spoon. Cover and cook on low heat for about an hour and a half, stirring occasionally. Steam the rice (1.5 cups of rice, 2.5 cups of water, pinch of salt, microwave for 7 mins on 70% power and another 7 mins on 100%). Uncover the curry and reduce over medium-high heat until thick. 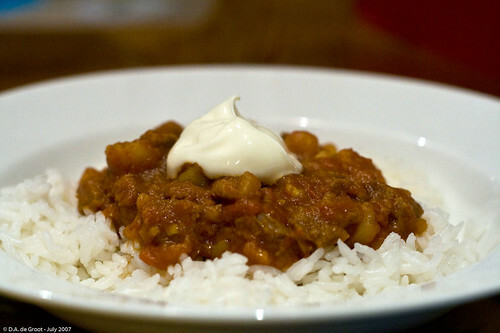 Serve on a bed of rice with a dollop of yoghurt.